The Holiday Light Show (HLS) went well last night despite the day being damp and the evening being very humid with light mist. The crowd of 2,300 seemed to enjoy the HLS and with six remaining nights, we hope to see continued strong attendance. See www.rotarybotanicalgardens.org for more details on this event including options for pre-purchasing tickets for this event which is highly recommended! The show will continue after Christmas for four additional nights (Dec. 26, Dec. 27, Jan. 2 and Jan. 3). Larry H. was in for some odds and ends out in the show while Bill O. came in to collect garbage. I continue to work on 2016 preparations and am just starting to get in to the seed catalogs. I saw my first Digiplexis in 2013 at a trial garden. It was the variety ‘Illumination Flame’ which is pictured above and in the three photos directly below this text. 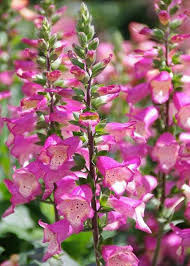 This hybrid plant is the cross between a foxglove (Digitalis purpurea) and Canary Island foxglove (Isoplexis canariensis). The early breeding work was done by Charles Vann, a plant breeder from the company Thompson & Morgan. After this plant won the Best New Plant Award at the Royal Horticultural Society Show in 2012, it exploded on to the scene and continues to be popular. Many others are now breeding selections. The genetics of the parents continue to be in dispute but in essence, are very closely related. Technically, the genus for this plant should read xDigiplexis although some vendors continue to use Digitalis hybrida…Regardless, these plants are very distinctive in their appearance and impact! It is important to note that these hybrids are only hardy to zone 7 so we use them as a long-blooming annual in Northern climates. The plants are sterile so they continue to bloom as they wont put energy in to seed production. Reaching heights around 36″ and a width of 18″, these are excellent in the full sun border. They will tolerate part shade but full sun in moist, well-drained soils is ideal. Once they start blooming, they simply keep going. We provided supplemental fertilizing every three weeks which they seemed to enjoy. Last year we planted 300 or so of the ‘Illumination Flame’ variety and they were spectacular for four months. We’ve only grown this variety at RBG thus far but the Illumination series also includes ‘Raspberry’ (pictured at the bottom of this blog). The remainder of the photos were taken at various trial gardens. The variety ‘Berry Canary’ from Walters Gardens is nice as well with a beautiful shade of pinkish purple (the photo of ‘Berry Canary’ below is from the internet..not mine). The Foxlight Series (Rose Ivory and Ruby Glow) are also quite nice although they are consistently called a hybrid Digitalis. See further below for these neat selections. Whether they are grown as an annual or a perennial in warmer climates, these hybrids are worth the real estate they inhabit. They also attract bees, butterflies and hummingbirds. Keep an eye out over the coming years for more introductions and selections from this exciting new addition to your planting palette.